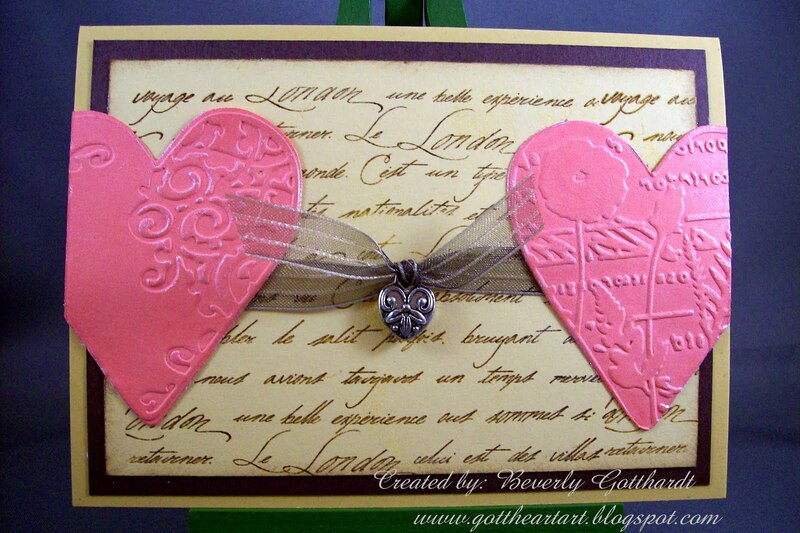 When I saw this sketch at Get Sketchy I immediately thought of the Textile Hearts Cuttlebug Cut and Emboss set. I've used it quite a bit and I love to rub these Metallic Rub-ons over the raised areas. Supplies: Dk.Saffron Card Blank 4" X 5 1/2" Halcraft, Papers: Stampin Up, Stamp: Stampabilities-LeLondon Script, Ink: Ranger Archival Ink-Coffee, VersaMark Ink pad, Stampin Up clear embossing powder, Cuttlebug cut and emboss-Textile Hearts, Craf-T Metallic Rubons, ribbon-Hobby Lobby, small heart charm. 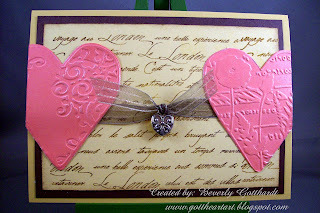 Very pretty card - I love the hearts connected with the ribbon! thanks for playing with us at Stampin' Royalty. Gorgeous! I love the texture on those hearts! Thanks so much for playing with us at Stampin' Royalty again this week! Love the hearts! pretty! Thanks for playing along with us at Stampin' Royalty! Oh Bev - great card again. Beautiful work. Thanks for playing with us at Stampin Royalty.